Get Ready for Christmas! Gift Card Holder Shaker Cards! Want to see how I made this card? Well then, watch the video! Tutorial sponsored by Top Flight Stamps! Use coupon code thefrugalcrafter10 to save 10% on your order! 1. Stamp design with pigment or embossing ink. 2. Sprinkle with embossing powder. 3. Heat up the gun for a few seconds before bringing to the film. Heat powder until it melts but if an area starts to warp pull the gun away, then go back in and heat some more after it cools. Embossing powder melts faster on acetate than paper typically. Let’s have a relaxed holiday, shall we? Do something today that future you will thank you for. I think that’s worth celebrating! Thanks for stopping by and til next time happy crafting! Hi friends! Sometimes you make something that is really quick, easy and cute. This is one of those times. I don’t like to shop and I don’t want to give gifts that will collect dust either. Mostly, I’m lazy and giving the gift of cash, especially to older kids, goes over really well. See, most kids don’t have jobs and unlike a gift card it can be spent anywhere. Plus, I have to admit, I am a horrible gift giver, sometimes I get it right but mostly I am clueless but I can make cute stuff so I put my effort there:) Buy hey, if you are a steller gift giver you could whip up one of these tins to give your awesome gift in! I just realized that now everyone knows that I don’t put that much effort in to the packaging either. Hmmm, I really need to rethink my blog topics. I am giving all of my secrets away. I guess it’s good that not many people I know in real life read my blog LOL! Hey, just because it is fun and easy doesn’t mean it’s not worthwhile and made with love. That’s my story and I’m sticking to it! 1. Paint tin with chalk or acrylic paint, let dry. 2. Stamp cupcake and cut out. 3. Glue cupcake to lid of tin and glue pom-pom trim on the edges of the tin lid. Accent with sequins. I want to thank Papermart for sponsoring this post, they have so many cute things for packaging gifts and goodies and you can’t beat the prices. Thanks for stopping by and til next time happy crafting! 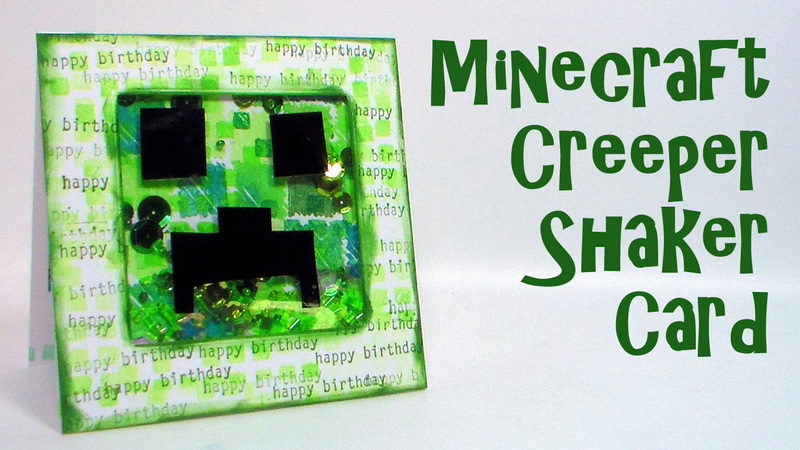 Make a Minecraft Shaker Card! Hi friends! I always have a hard time thinking up gifts for teen boys but cash in a card is usually a safe bet, especially if the card reflects a favorite video game! The best part of this card is that it is simple and you can probably find the things you need to make it in your craft stash! Watch the video to see how easy it is! Card fill: sequins, beads, glitter, etc. 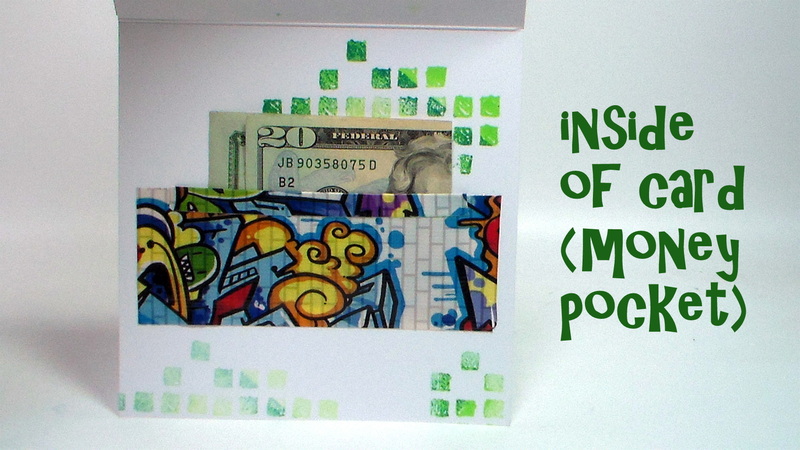 The inside of the card has a pocket to hold cash or a gift card. Feel free to adapt this idea to suit other themes as well! Thanks for stopping by and til next time happy crafting! Hi Friends! The other night we gave our girl scout leader this wallet filled with gift cards. It was like giving someone a shopping spree. She really liked it. Tonight I will show you how to make it. as a bonus I get to use up some of the envelopes that sealed themselves shut when I was not looking, I guess I need to run that dehumidifier more if I am going to craft in the basement! Another good thing is that you can remove or add more pockets if needed, they simply slip under the string. Thanks so much for stopping by and til next time happy crafting! I started by cutting a 5″x12″ piece of sturdy patterned paper then used a label die to shape one end of the strip. Then I scored and folded the paper so I had a cute purse with a gusset at the bottom. I sealed and cut the ends off three envelopes, stacked them and folded them in half then I punched tabs in the center of the open ends to make the gift cards easy to remove. I punched holed through the stack of envelopes and gusset area of the purse and used baker’s twine to tie it together. I made the handles from Jute cord. The flap is secured with hook and loop tape, only $2.39 for a 10 yard roll of each! I embellished the purse with die cut leaves and flowers as well as buttons. For further instruction refer to the video. I hope you enjoyed this fun and easy project! Happy crafting!